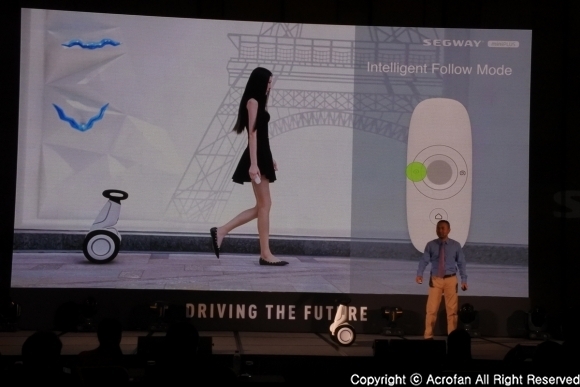 On August 28th, Segway held the new products conference for Asia-Pacific region at the Millennium Seoul Hilton Hotel in Jung-gu, Seoul. 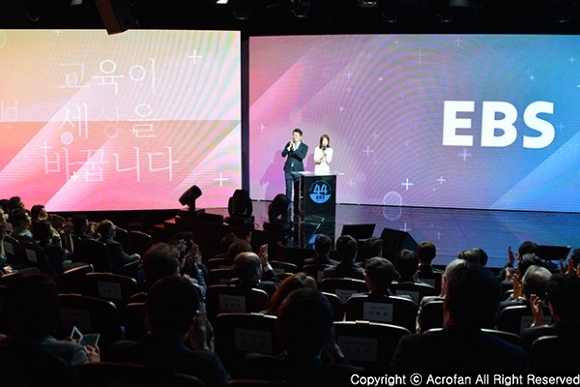 Five new products, including Segway miniPLUS, were presented at the event, with agents from each Asia-Pacific region and overseas medias from Asia-Pacific region attending. Segway miniPLUS is equipped with a number of 'Black Technology', such as wireless location technology, and it can be used conveniently. In addition, it has a PTZ camera and can be operated for 35 kilometers for a single charge. Segway miniLite is a lightweight electric wheel for children aged 6 years and over. It focuses on safety and comfort, and features environmentally friendly protective equipment, safety devices and a mobile phone app. Segway KickScooter has improved the appearance, performance and safety from the existing Kickboard, and it is presented as a safe and practical electric kickboard with excellent cost performance and design. Moreover, Ninebot & Segway Kids Bike is designed to be fun, safe and comfortable with materials and designs that are designed to be like a big toy only for kids. Ninebot & Segway One Z series unicycle wheel, designed for unicycle electric wheel enthusiasts, satisfy the demand for design as well as thrill and safety. 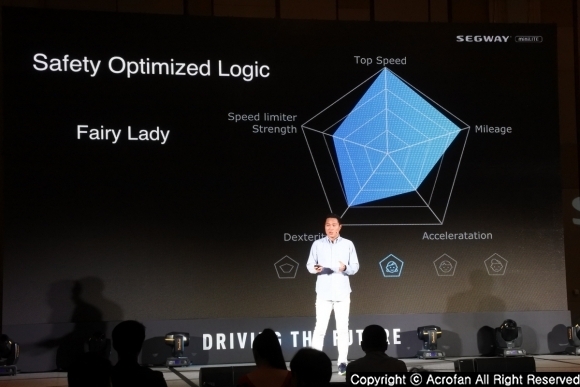 Zhao Zhongwei, the COO of Segway, introduced Segway that it has been doing B2B-centric business that supplies products to companies in tourism and security industries, but nowadays, there are many new generations who like Segway and it is widely used by individual users for moving. Tourists are also enjoying it through 'Segway Tour Service' in various countries. 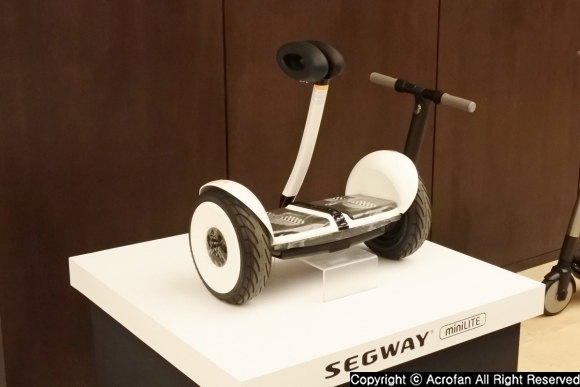 Additionally, she explained that Ninebot took over a 100% stake of Segway in 2015 and there was a change to the brand. 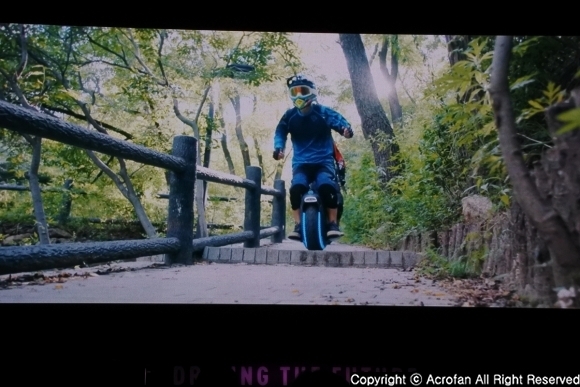 Segway was popular in Korea last year with new products. According to the analysis of the behaviors of users around the world based on the Big Data system, it is found that users traveled 1.2 billion kilometers using Segway and more than 6 million people use Segway products and services every year. Moreover, Segway has a global business center in the United States, the Netherlands and China around the world, has developed business on each continent and has more than 700 key patents. Segway has been continuing its history for over 16 years, and, after merging with Ninebot, it has been trying to improve the B2B-based business, appearance and price, which were the three concerns initially pointed out. Furthermore, as the products are stylish in design and customer targeting, more people are now able to access and use the products. At the same time, it has been working on marketing activities in appropriate markets, participating as partners in various events such as the Beijing Olympics, and introducing 'Segway Tours' for tourists in sightseeing destinations with apps designed for individuals. ▲ The technology of Robotics part was treated as a quite significant part. 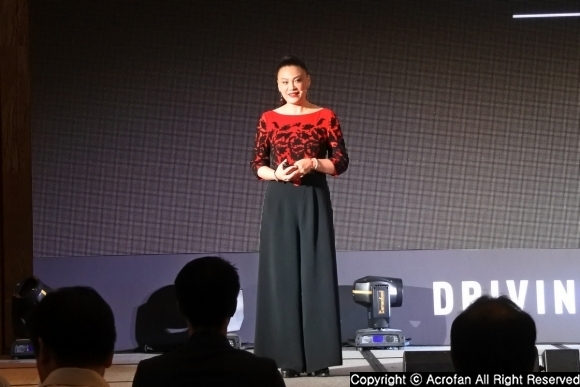 In Segway's Robotics business, 'Loomo' robot that has been on the market since 2016 is representative and it is expected to be an important business area in the future. 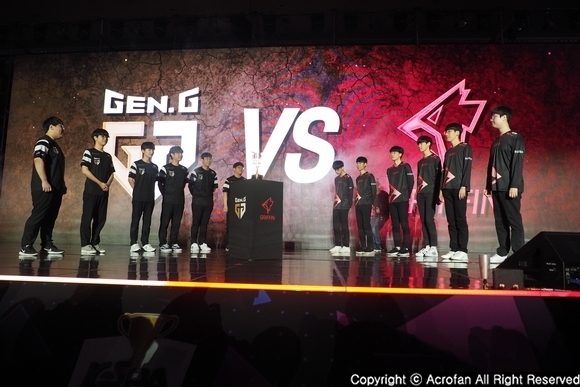 So far, two generations have been presented for two years. Moreover, Segway is building a collaborative platform for robot development, and not only famous companies such as BMW, Intel, Google, Amazon and Facebook, but also leading universities such as MIT and Stanford are participating in the platform. Segway has also introduced ‘Loomo go’ for the shipping industry, as well as models for schools, research, and the enterprise. Today, Segway's products are being delivered to consumers through more than 1,000 sales networks in 2016, and Segway is committed to continually expanding its network. In terms of partnership of distribution channels, there are nine main channels in the United States, and Alibaba, Jingdong and Xiaomi in China, and ‘11th Street’ and ‘didigo.com’ in Korea are mentioned as major channels. Besides, it is introduced that Segway is working with major channels in Asia Pacific and Europe. With the slogan 'Simply Moving', Segway has made a major mission to make things easier and more convenient for people and things, and to provide products and services to more than a billion people around the world. 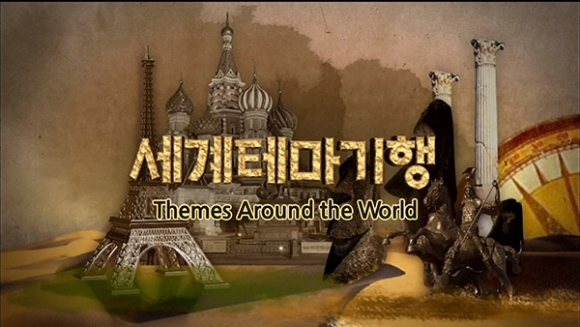 The Korean market is also included here and that it is expected to take an important part. 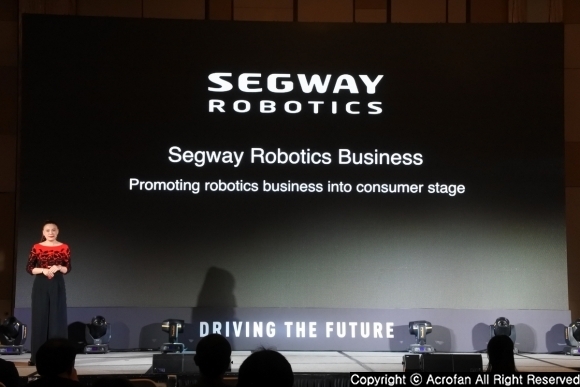 Meanwhile, Segway's Asia-Pacific business is centered in Beijing with its service center in Singapore and production in China's Tianjin and Changzhou, all close to Korea. 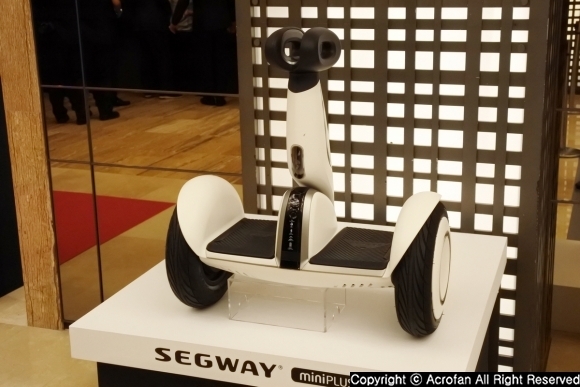 ▲ An upgraded type of Segway miniPRO, "Segway miniPLUS"
▲ As an interesting function, "Intelligent Follow Mode" that follows the remote control was mentioned. Based on the success of Segway miniPRO, which was launched at the end of 2015 and was purchased by more than 1 million people in the market as well as being shared by manias about its experiences, Segway miniPLUS reflected customers' main feedbacks including extending area of footrests, improving speed, and expanding intelligent functions. Segway miniPLUS is at the middle stage between the existing 'miniPRO' and a robot. It looks similar to miniPRO, but it is quite different, with 19% more extended footrest area, 17% higher chassis height, and 11-inch tires. In 'Mini Plus', with the lamps including taillight, the height of the headlamp for night driving was raised to 36cm, and the battery was installed with 329Wh based on LG Electronics' 18650 lithium battery, assuring 35km of travel distance. It also features a trunk space for storing accessories. In addition to this, new features such as "Intelligent Follow Mode," which follows the remote control by pressing a button on the remote control and moving with it, and "Stabilized Camera" function, which enables FHD-level photography using an app, were introduced. 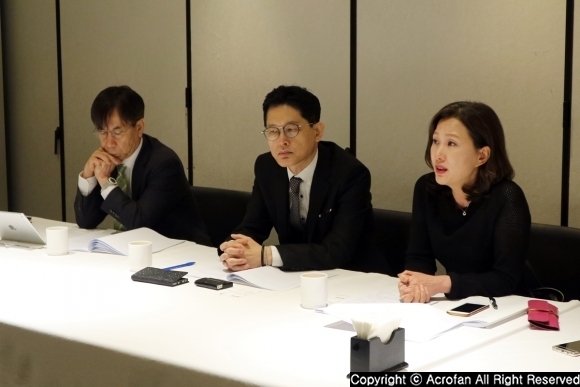 Domestic price was announced as 988,000 won. Segway miniLITE is a small model that is based on the idea that the existing miniPRO is not suitable for use by women or kids. 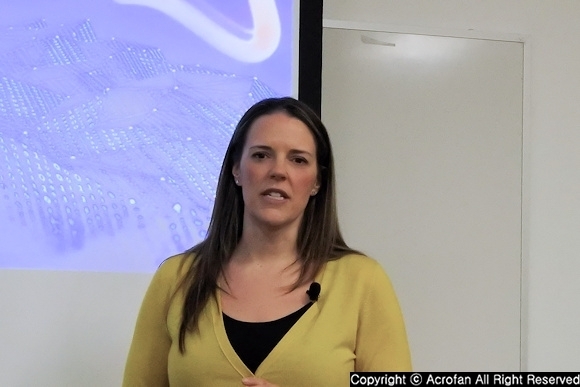 It is targeting kids aged 6 years or older and a female customer. With the knee bar is 74mm lower than the miniPRO, miniLITE starts operating at a minimum weight of 10kg and its weight is 12.5kg, which is the lightest of the current Segway models. It can also feature many functions with an application, and have training programs and a practice mode to give customers enough practice for their safety. This model is equipped with safety-optimized logic, allowing the user to adjust the safety assistant settings optimized for female users who do not perform high travel speeds, rapid breaks, and turns, or adjust acceleration control for active children. The maximum speed is 16km/h, the travel distance is about 18km, and there are three color cover accessories for the individual personality. 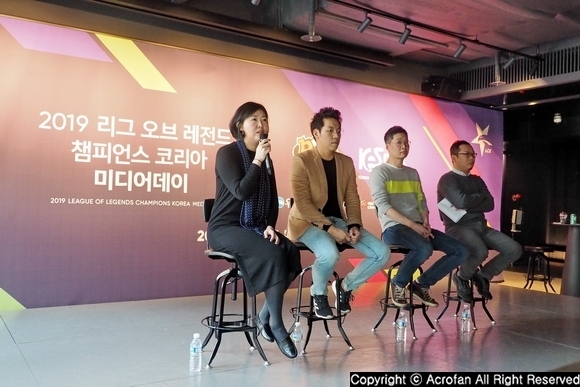 The price was announced at 529,000 won. 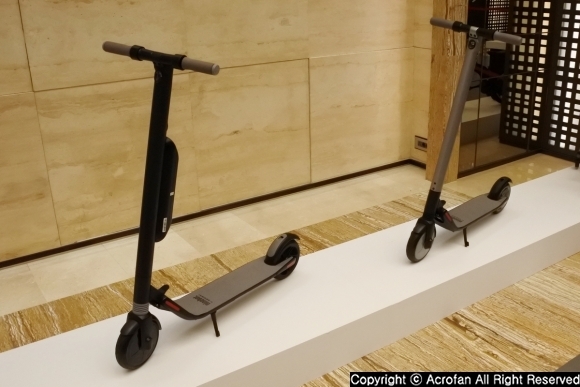 ▲ Ninebot Kick Scooter models has two versions, the standard version and the sports version. ▲ The difference between the standard model and the sports version is the difference in weight, output, and suspension configuration. Ninebot by Segway KickScooter features a simple, compact design that pursues minimalism, with a light weight of 11kg, which can be carried with one hand. By using a frame made of aluminum alloy grade for aircraft grade, it can withstand load of 700kg or more, and the battery is waterproofed by IPX7 grade so that improved stability in use environment. In addition to the 'one-push folding system', which can easily be folded and carried, when folding, it can be carried like a carrier by using wheels. 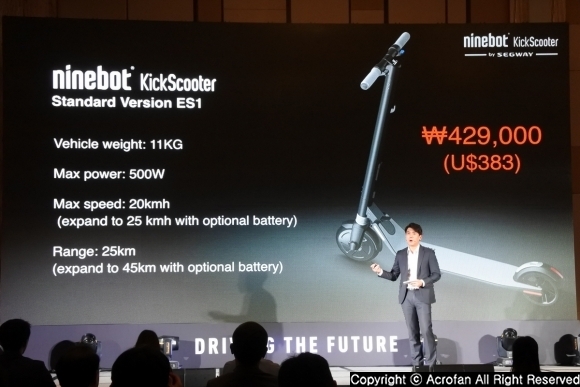 Ninebot KickScooter established the braking distance of less than 4 meters with electronic and foot brake's dual braking system as well as high efficiency low noise motor, and the display attached to the bodywork shows the speed, battery level and Bluetooth connection state. By equipping additional auxiliary batteries, the maximum travel distance can be extended from 25km to 45km. Front and rear lights and brake lights provide safe night driving, and the ambient light on the footrests can be customized by the application. With the application, it is also possible to find other users, lock, limit the speed, and control the light and cruise. Ninebot KickScooter ES1 weighs 11kg and has an electric motor with a maximum output of 500W, with a maximum travel speed of 20km/h and a maximum travel distance of 25km. With an additional auxiliary battery, the maximum speed increases to 25 km/h and the travel distance to 45 km. 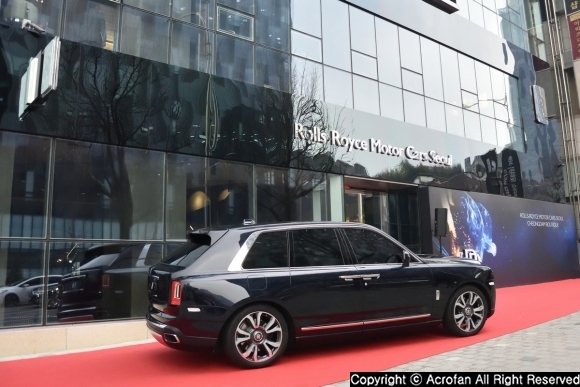 The price was announced at 429,000 won. The high-performance version, the ES2, weighs 12kg and has a maximum output of 700W, with a maximum speed of 25km/h, a travel distance of 25km under normal conditions and up to 45km with an auxiliary battery. The ES2 also features a dual suspension. 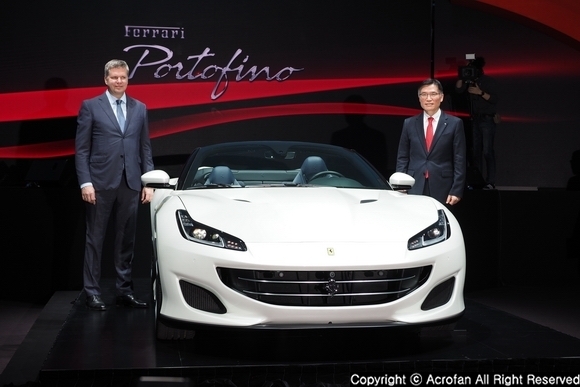 The price was introduced at 529,000 won. ▲ NineBot One Z series, whose motto is Batman, allows to travel freely on a variety of terrain. 'Ninebot Kids Bike' for kids has a combination of designs for boys and girls separately, a 14-inch and a 16-inch wheel, and three colors. It was introduced as a safe, affordable product for kids. The 14-inch wheel model weighs 8.8kg and the 16-inch wheel model weighs 10.8kg. The frame is based on aluminum, with reliable tires and ergonomic design. The price was announced at 179,000 won for the 14-inch model and 199,000 won for the 16-inch model. Meanwhile, Ninebot & Segway One Z series unicycle wheels for manias are aiming to make up for the shortages of the existing models and to be able to ride freely anytime and anywhere, and it emphasized 'redefinition of one-wheel'. In aspect of concepts such as design or ride, "Batman" is a motto for responding to various terrain. The product will be available in Asia beginning in early 2018 and will be available in conjunction with a new movie of Batman series.